The internet has become a valuable tool that we use every single day. Whether we use a desktop, laptop, ipad, or our cell phone, we are on the internet. Since I started my new company I have been registering and signing up for several different websites; with those sign ups and logins comes another password that I have to keep track of. I was always taught to never use the same password for different login accounts. It would be easier to have just one password to remember, but in today’s society that is not smart. I created the Top Secret form to keep track of all the different accounts and passwords. All of the forms that My Life Planners creates are a PDF digital fillable form. Anyone who has the Adobe Reader can use my forms. If you do not have the Adobe Reader software it is a free download here. One of the benefits about a fillable form is that you can type right on your computer or electronic device in the fillable slots. Once you have it filled, you can either print the form with the information on it or resave the file using a different name. This gives you the option to still have the initial blank form to add more passwords should you need it. Because I am a new company just starting out, I thought it would be nice to give the Top Secret form out for free. Who doesn’t have passwords to keep track of? Right! This gives you the opportunity to test drive my forms and get a feel for what they are all about. I have even included two different styles so you can have a choice of which one you like. 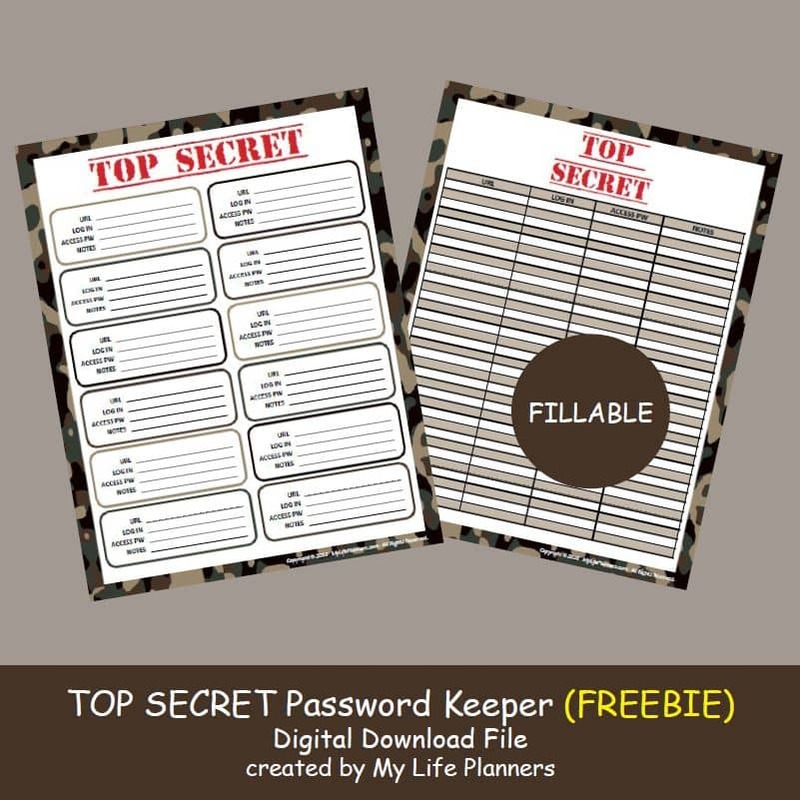 Enjoy the Top Secret password keeper and drop me a note to let me know how you like it. Please click here to download Top Secret. Remember it’s free! Join my email list and never miss a planner update, freebie or upcoming news again.